Spotted Glacier flows north from Mount Douglas and terminates in a developing proglacial lake. In the USGS map from 1951 the lake is not evident. Giffen et al (2008) noted that the glacier retreated ~1200 m from 1951-1986, a rate of 33 m/year. 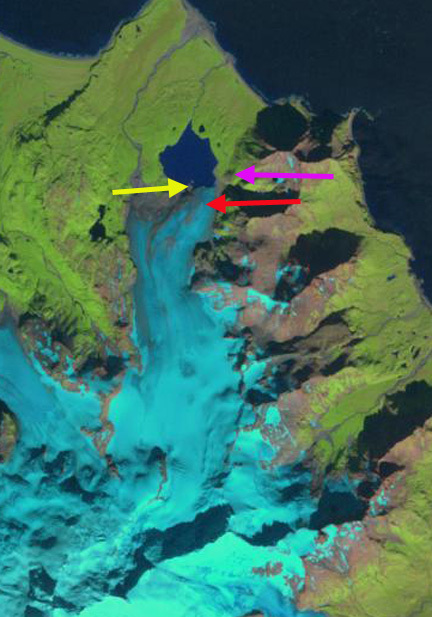 Here we examine 1985 to 2013 Landsat imagery to identify the terminus change of this glacier since 1985. 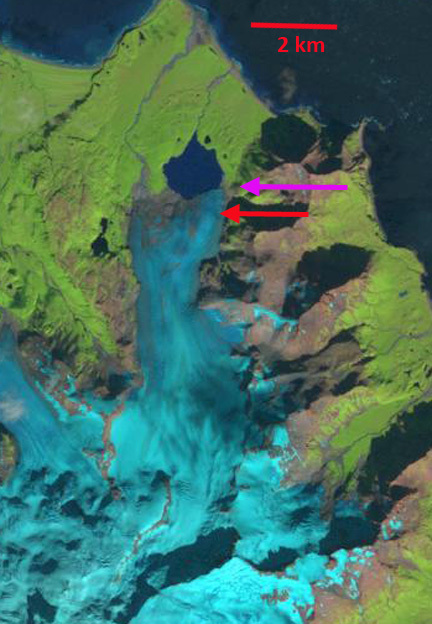 In each image the red arrow indicates the 2013 east side of the terminus, the pink arrow a rock knob adjacent to the 1985 terminus, and the yellow arrow a peninsula that should become an island as the further retreat occurs. 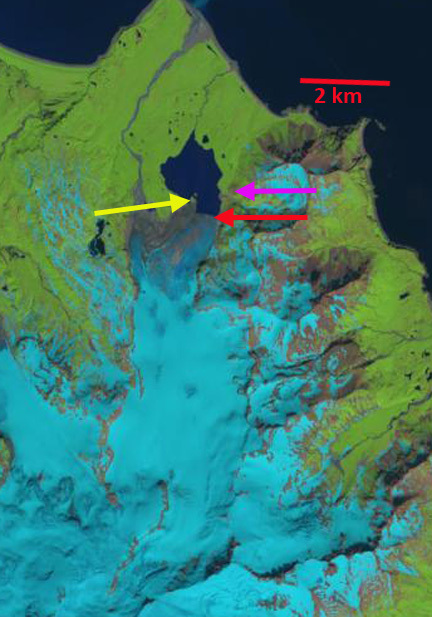 In 1985 there is no evidence of the peninsula, the lake is relatively round, and has a north-south length of 1250 m. By 2000 the glacier has retreated sufficiently to expose the peninsula at the yellow arrow. The lake is now 1450 m from north to south. Neither of the images indicates many icebergs suggesting this is currently not a main mechanism of ice loss. By 2013 the peninsula is 450 m long, the north-south length of the lake is 1700 m. The retreat of 450 m in the 28 year period is nearly 30 m/year, a similar rate to the 1951-2000 period. 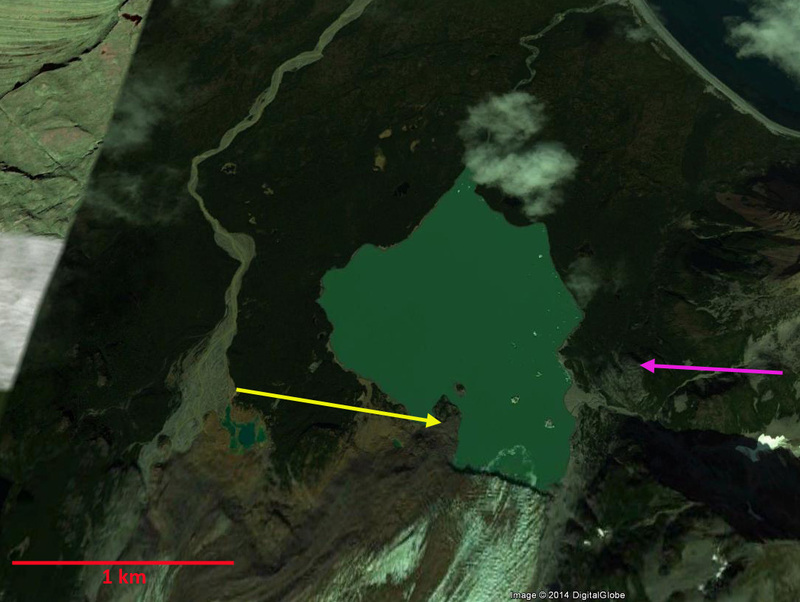 The 2012 Google Earth image indicates a few small icebergs in the lake, again suggesting that despite some calving this is not a main glacier volume loss. The glacier front remains active and crevassed, suggesting that retreat will remain slower than for nearby Fourpeaked, Excelsior or Bear Glacier. 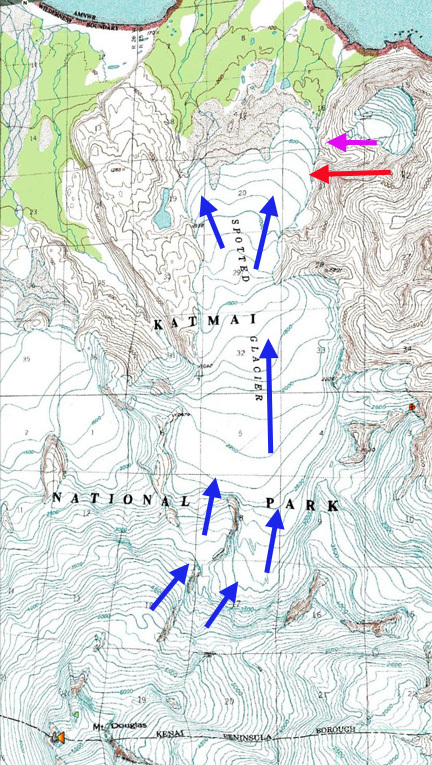 This entry was posted in Glacier Observations and tagged alaska glacier climate change, alaska glacier retreat, katmai glacier retreat, spotted glacier retreat. Bookmark the permalink.